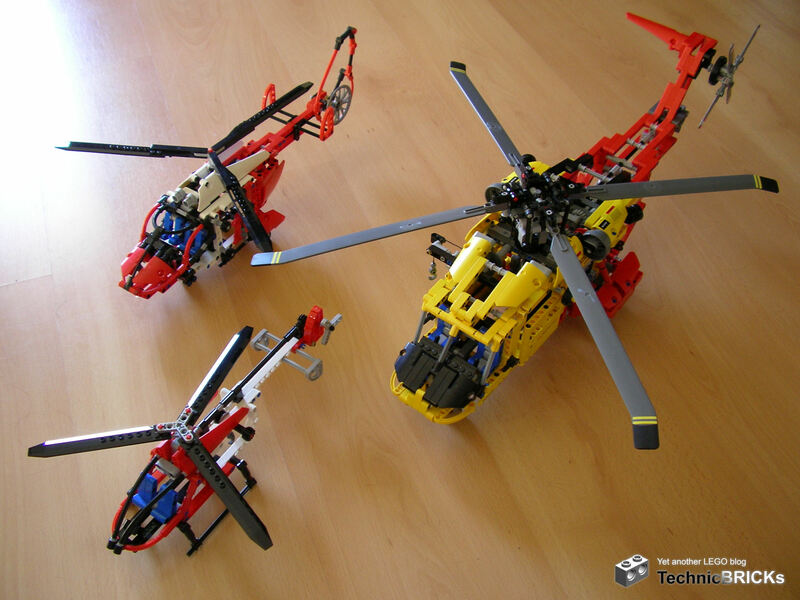 When I was reviewing the 9396 Helicopter, I always had present in my mind that luckily I happened to also have the previous LEGO Technic helicopter sets, still in their boxes waiting to be built. So, the opportunity presented itself for a comparison and some set-building. The most striking difference is the size. 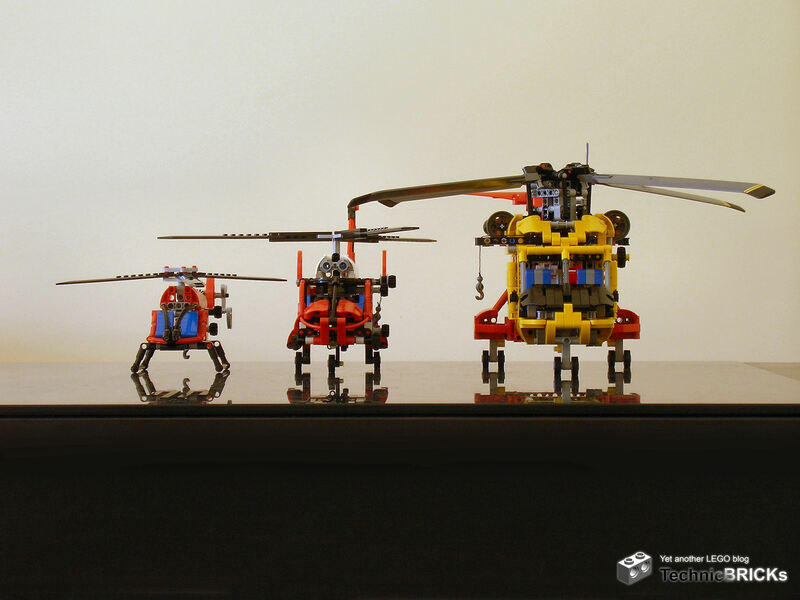 It would seem that, like sauropod dinosaurs, Technic helicopters became bigger with each passing generation. The 8046 was the second-smallest set of 2010, with 152 elements. The next year, the 8068 appeared, being the fourth smallest with 408 elements. Now in 2012, we have the 9396, with 1056 elements and being the second-largest for the year (the 9397 Logging Truck may have more elements and be one reference number above, but the model itself is smaller). Also, while the two smaller models have a red and white colour scheme, the "big brother" replaces the white elements with yellow, more usual in Technic. As for features, each one has all its predecessor's, plus adds a few on its own. Not only the 9396 is much larger than the other two, but it also appears to represent a larger, bulkier and slower kind of helicopter: whereas the former looks like the Sikorsky S-61R (with capacity for 28 passengers), the latter are more similar to the Eurocopter AS365 Dauphin (with capacity for 11 passengers). Finally, here is a short silly video showing the hierarchy between the three recent helicopters, with the side effect of proposing a possible reason why new sets no longer include techfigs: it is hard to make a model at the same time in the desired size and in the correct scale for a techfig occupant. While I doubt we're getting next year anything bigger and more complex helicopter-wise than the 9396, the trend is undoubtedly intriguing... If indeed 2013 brings an even larger rotorcraft, what can we expect? From here, the only improvements I can see are cyclic pitch control, which would be a first in LEGO Technic, retractable winch arm, bringing back the memory of the venerable 8856 Whirlwind Rescue, and, stretching hope and imagination even further, that elusive goddess nicknamed "real flying made only with LEGO elements". This is a theme where it's quite appropriate to say that "the sky is the limit"! But should you have asked me, and I would have lent for the comparation at least one of the sets that I've desired most as a child (8844 Helicopter), to only buy it in used condition, as an adult more than 25 years later. 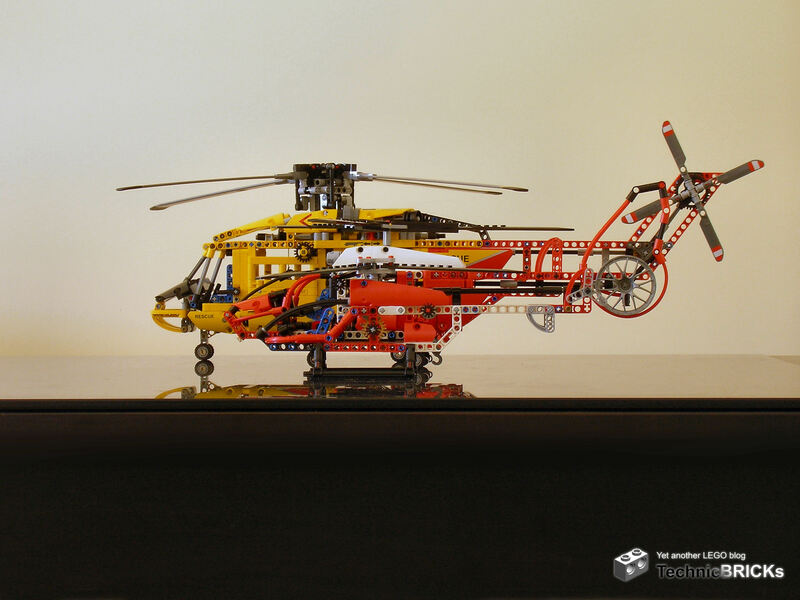 I know that, helicopters aren't exactly rare on Technic. ;) I just wanted to include the three most recent, with which people are more familiar with. 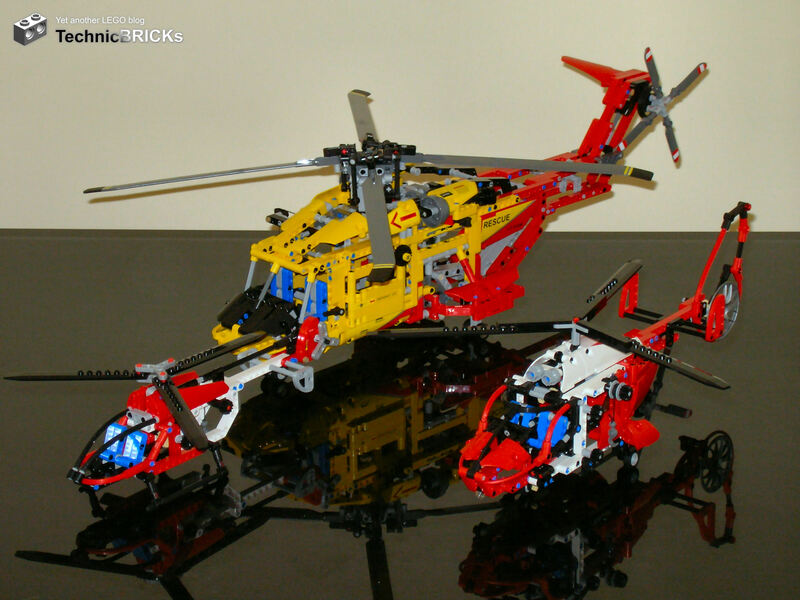 The AgustaWestland CH-149 Cormorant, even in red/yellow color scheme. Hmm, while the Cormorant looks indeed like the 9396, I think the S-61R looks more similar because it only has 2 engines and the rear horizontal rear stabiliser is at the top of the tail instead of at the bottom. Then again, neither has the supports connecting the fuselage to the sponsons. Either the 9396 is inspired by some other model, or it's a completely original design.